Take an example at this AT&T with your one measly bar of service. Service anywhere we go … YES!!! The new baby has arrived. 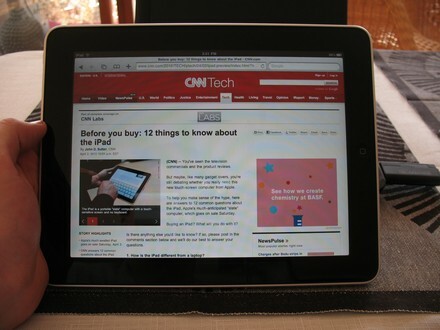 The Apple iPad, Apple’s latest brain child is touted as their most revolutionary product, and we pre-ordered one. Not because of the hype, but because we like the iPhone, which does seem undersized for use at home. 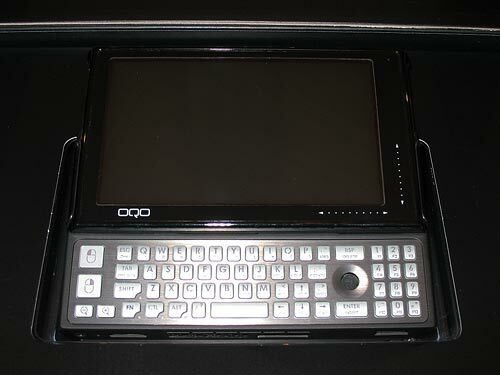 With the announcment of the iPad it also became obvious why Apple never produced an ultra-mobile PC / netbook class machine, and likely never will, so one might as well get an iPad then. 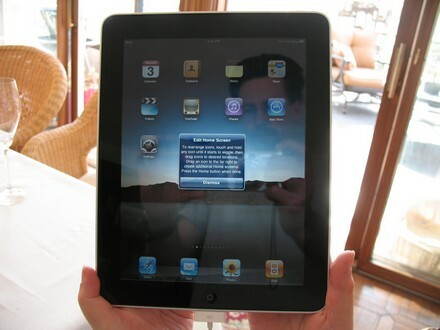 If you are familiar with the iPhone or iPod Touch, the iPad will be most familiar, if not, it is very intuitive. 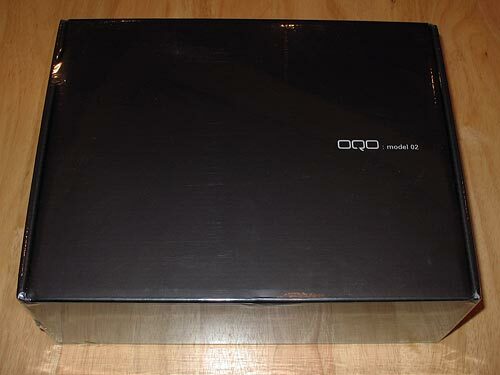 Unboxing. 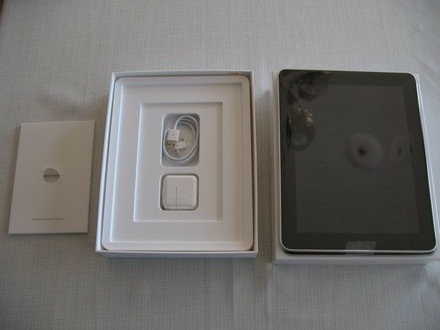 There is not much in the box: iPad, cable, charger and a tiny pamflet. No headphones, stand, dock, … which was known at the time of ordering but I think a basic dock should have been included. It is very glossy: iMac glossy, but now in a portable version that will be angled towards the ceiling and user. 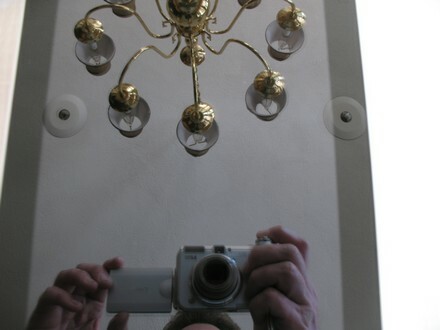 Even with the brightness all the way up you get reflections abound. Part of me wants to call this the iMirror. 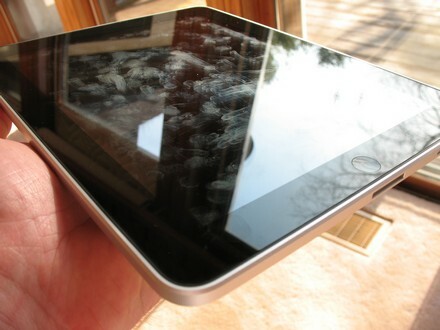 Fit and finish is not 100% and I dare to say that Apple rushed these out the door. Our iPad screen and case are not entirely flush all the way around the device. See the black line appear and disappear outside of the aluminum frame. The first start is a let down because you have to activate it with iTunes and need to get the latest iTunes update as well, so you’re just sitting around twiddling your thumbs for 20 minutes till iTunes is updated before you can really turn the thing on. Then it wants so sync apps, music etc. Another delay in gratification. Finally you get to the home screen. The iPad is bigger than you think and heavier than I thought. 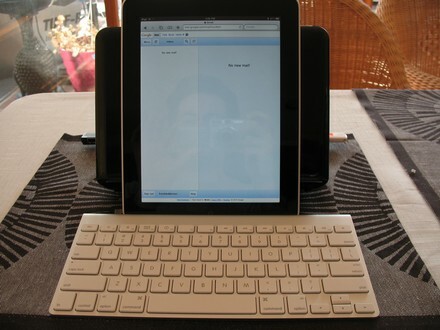 In size it compares directly to a 10″ netbook screen and the weight is probably the same as a netbook without battery. It has a curved back, meaning that it doesn’t lay flat in a stable way. It wobbles a bit when you type on it. Typing is very doable. Easier than I thought. You will need a dock or some kind of stand. You can hold it in your left hand and tap around with your right hand, but you’re not going to do that for anything but brief periods of time. If you put a lower edge on the table, so you’re not lifting it anymore, it still wants to scoot around. Propped up against the MSI Wind for a stand, since the dock and other accessories are still days and weeks away. The machine is fast. 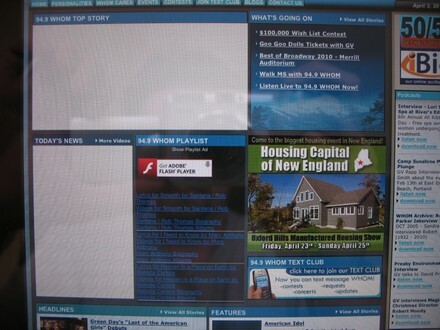 The user interface is very responsive. Connecting to WiFi was no issue. It detected our home WiFi network and upon selection it requested the password. Done. Safari is fast. 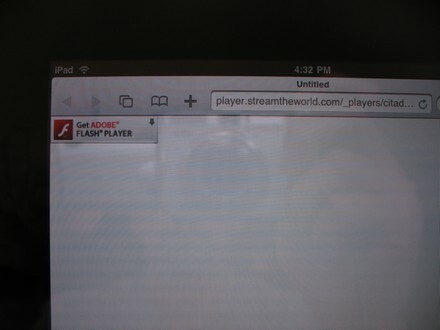 I have managed to crash iPad Safari three times trying to log in to MacWorld. Otherwise it has been stable. Most sites work and load fast. 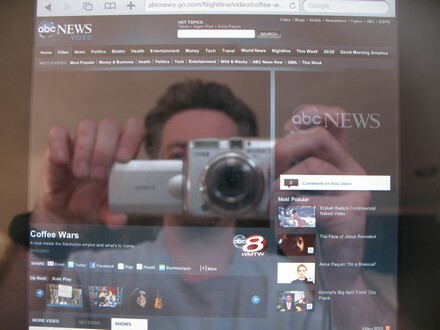 The elephant in the room is of course that there is no Flash and no Silverlight, meaning you will not see video content from a whole range of sites, for the time being. I just hope that we won’t need multiple news/video/radio apps to the tune of one for every single TV and radio station that will stick it out with Flash. Propping it up in your lap is not the greatest. You need to hold it with one hand or prop it up against a bent knee. 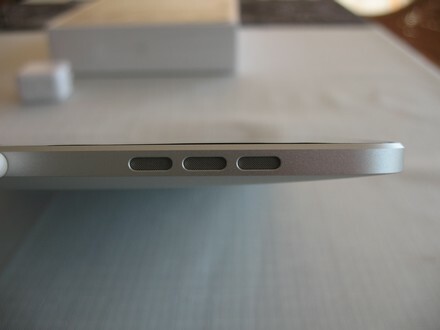 It has a tendency to sit really low in one’s lap, hiding the home button under a t-shirt or whatever clothing. Did I mention this thing is a finger print magnet? Clean hands on a warm 70+F spring day. 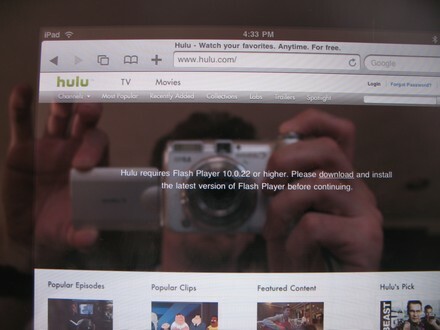 Readability of the screen: very high. The IPS screen is great. I do wonder if they couldn’t have made an iPad nano. Same screen resolution, but the whole device fitting inside the area within the bezel. I’d forego some battery life etc for a bit smaller size and lighter device. I’ve clicked around in most apps. I am sure there are other sites that will cover the variety of apps in great detail and point out the various shortcomings. I have very mixed feelings about tethering it to iTunes to bring documents and files in an out of the iPad. I will have to increase my cloud computing. No USB, SD … file access. I am really missing a USB or SD card reader slot, so I can just pop in several GB of data without having to sync or push and pull things through a cloud, email myself, … Ugh. No printing. I don’t expect to have direct printer support on the iPad … but can’t we get a conduit to send anything via PDF to a networked mac and have it push things to the printer? No tethering. I know there are a couple reasons why we can’t tether to the iPhone (don’t overtax AT&T, pay extra for iPad 3G, pay for AT&T iPad 3G account) but it shouldn’t have to be that way. 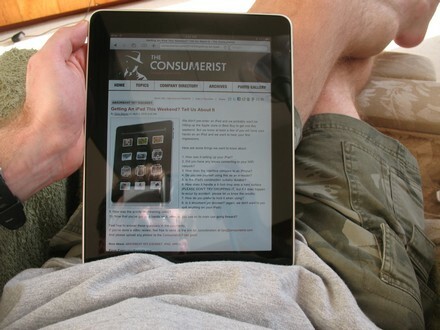 As an individual you can only use the iPad or the iPhone at the same time. 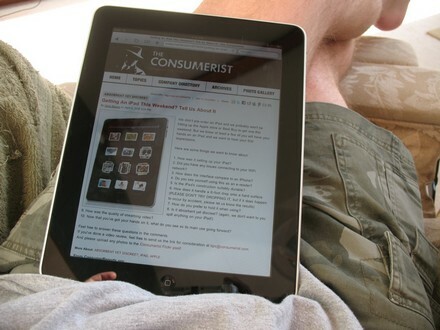 If you share your iPad with a family member on the road, so be it. Single user only. C and I have different internet habits and needs, use different apps, … it would be nice to have the ability to setup two users. Even a guest user account would be handy. Keyboard. On a screen this size, why couldn’t they put the number row up on the virtual keyboard? So you don’t have to keep swapping keyboard styles to put some numbers for passwords. Typing in PASS123word456 is more cumbersome than it should be. I guess you should only do it once and have it save the password. Nonetheless, that row of # would be handy throughout all apps. While using the bluetooth keyboard, I kept wanting to use a mouse; but instead had to move my hand up and touch the screen. I have to get the bluetooth mouse out of the office and see if works, for the heck of it. Home screen. Why couldn’t they fit more buttons on a single page? There is a a lot of wasted space. App button management. 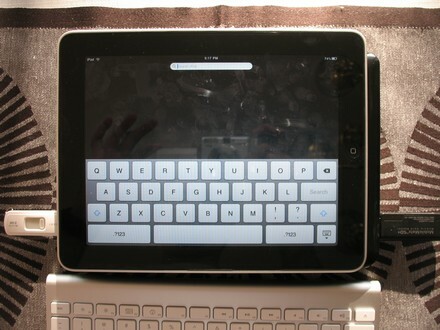 The iPad received all 100+ apps from the iPhone … in alphabetical order. This is the third time all iApps are scrambled into alphabetical order … grumble … can we finally have some fixed categories or sorting options, please! I’m really hoping a ton of people will send feedback Apple’s way to take this mobile OS to the next level, just like with the iPhone. If you have questions, feel free to post in the comments and I will answer to the best of my abilities & time. 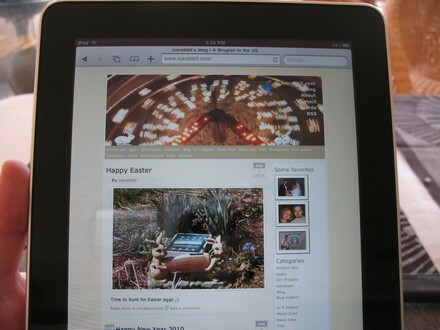 I am also more than happy to do brief visits to your website with the iPad and comment if it all works fine. Nothing fancy. Just my previous desk with the G5 and the mini and a big work table besides it. Only half my stuff is hooked up, and I still need to snake some cat 6 in, so I’m getting by on wifi to the router & NAS on other side of the house. Currently on the bench: macbook with dead battery ( + full backup + snow leopard clean install) – hp slimline with dead psu -toshiba notebook waiting for windows 7. Here at icerabbit HQ we have been a little too busy recently to focus on testing the new Mac mini 2009 2.26GHz with other hard drives, after we upgraded the memory. Last night I finally gave the mini a nice place on my desk under the 20″ Cinema Display to which it is hooked up. My original plan has been to use the Mac mini with a faster 3.5″ external hard drive, rather than upgrading the internal drive, which is rather tricky. If you like detailed instructions to perform such an upgrade, look no further than this iFixit guide. Noting that I haven’t switched to the mini as my primary machine yet; so far, I have been very satisfied with the speed of its 2.5″ Fujitsu …. hard drive. The combination of this drive + the mini is more responsive than many macs with 5400 rpm drives I have seen over the years. So, I haven’t special ordered an anno 2009 zippier 3.5″ 7200rpm drive yet for the ministack. Right now it looks like I will use the ministack for secondary mass storage with a regular drive. I still want to do some tests using the newertech miniStack v3 with some older drives as well as a couple retail external drives from Maxtor (3.5″USB2 & FW400) and Seagate (2.5″USB2). While I agree that the internal SATA bus is the fastest connection, it doesn’t mean the internal hard drive is the fastest by default. Regardless of connection method, the internal hard drive is still the slowest component in the computer (apart from the optical drive) and so an external hard drive could be faster. Even if I don’t find something faster than the internal drive in the house it will be a fun exercise to see how long it takes to back up the mac mini using USB2, FireWire400 and FireWire800. What external bench scores will be? Which will be the faster drive? Which applicaion will be faster? SuperDuper or CarbonCopyCloner? And what about temperatures? Does all this hard drive activity kick the fans in overdrive, or not? Click through for the findings. Quite a number of people wonder if it is worth upgrading the Mac mini 2009 from its default Core 2 Duo running at 2 GHz to 2.26 GHz (13% CPU increase), so below are my first benchmark results. I hadn’t see any 2.26 GHz benchmarks yet, when I decided to order my mini with this upgrade. I figured it was worth it since I was going to save money on doing the other hardware upgrades myself. Upgrading the CPU, memory & hard drive kicks a mini over $1000. Note that I consider 2GB pretty much a mandatory upgrade, so it enables both memory channels and unlocks the shared graphic memory from 128MB to 256MB. The jury is still out, I think, about a 7200 rpm drive. Generally the hard drive is the slowest component in a computer (ignoring the optical drive) and a 7200 rpm drive should be faster than a 5400 rpm drive. But, other technical details come into play like amount of cache, # of platters, platter density, … and so you can see a great 5400 rpm drive hold its own against an average 7200 rpm model. Research is key. The PowerBook greatly benefits from the 100GB 7200 rpm drive over the default one, but maybe Apple made a good hard drive choice here. Note: Geekbench 32 bit demo mode. * I noticed after completion that Apple had a software update process running in the background that was pulling several hundred KB/s of updates, so that may have compromised the result. Upgrading the mini is not for the faint of heart, but I did it. More on that in my upgrade story. I had no idea why the second Xbench score was significantly higher the second time around with 1GB, only to see it drop back to a still improved level with 4GB. A fourth & fifth result were 131. Actually, the only difference that I am aware of was that the initial monitor topped out at 1024 x 768 pixels, versus the mini’s monitor now being 1920 x 1080. Back to the original 15″ monitor: Xbench 132. Default installation takes up close to 17GB with the OS & iLife ‘09. Boot time: 4 seconds to the “bong” and 35 seconds to desktop fully loaded with custom menu bar (iStat Menu), Wifi on DHCP, BlueTooth on. Shut down time: I have seen it shut down as fast as 5 seconds. Another time 32 seconds, where the display goes blank in 3-4 seconds, but it takes another half a minute for the mini’s power light to extinguish. All in all I am very pleased with the mini’s performance. I have been waiting for the mythical midrange mac for so long – namely since the G4 Cube was shelved and Apple went with Intel – that I finally bit the bullet and purchased a Mac mini 2009. Of course this probably means we will see Apple release such a mid-range machine in the next few months. Which would be the third, or is it the fourth?, time an Apple product we buy is significantly upgraded or replaced by a new model a few weeks later. C’est la vie. I know, you just can’t time Apple for some things. So, why the Mac mini? Well, it is very simple. There are three things I like in computers: horsepower, silence & a sense of value; and one thing I absolutely hate: glossy screens. 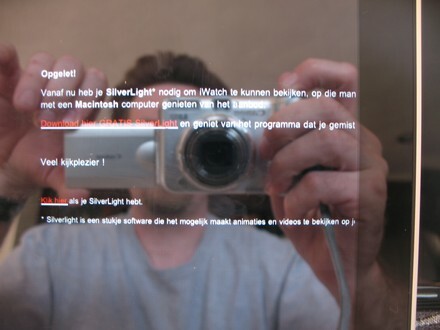 The latter immediately rules out the glossy iMirror, I mean iMac. If it were matte, I could be convinced about the all-in-one factor. Glossy MacBook & MacBook Pro = no thank you. We have two glossy portables (one of which a MacBook and the screen is really sub-par) and I see no need to buy another. The Mac Pro certainly has the horsepower, but $3000 for another behemoth like the G5? I would have to be mad. If Apple had a new Cube or a one third or quarter size Mac Pro, with Core i7 CPUs (instead of those $$$ Xeons), somewhere in the $1000 – $1250 range, I would order one instantly. Unfortunately the new Cube is still a pipe dream, so, there is only one machine left: the mini. With the 2009 revision it includes dual monitor support and after some evaluation, I figured the time was right to simultaneously downsize (in size) and upgrade (in cpu). 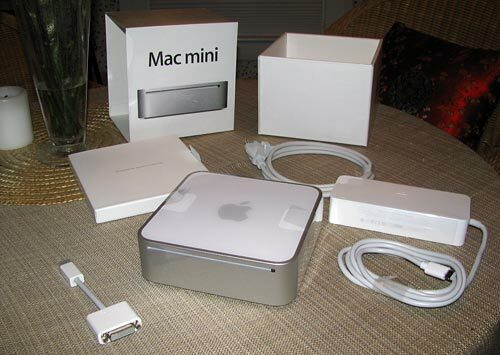 I decided on the base Mac mini with 2.26 GHz CPU and will do the upgrades myself. 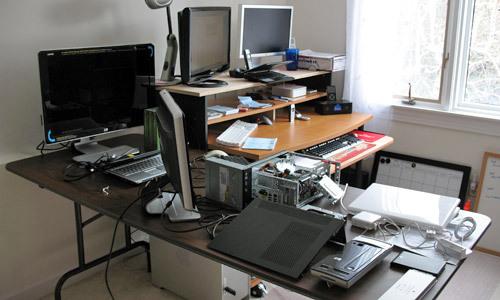 Only a mini DVI to DVI adapter is included, so if you have a VGA monitor, or something else, you will need an additional adapter as well as the keyboard, mouse and monitor. I was somewhat surprised by the huge power brick. It is hefty, but fortunately smaller than that of a Cube. 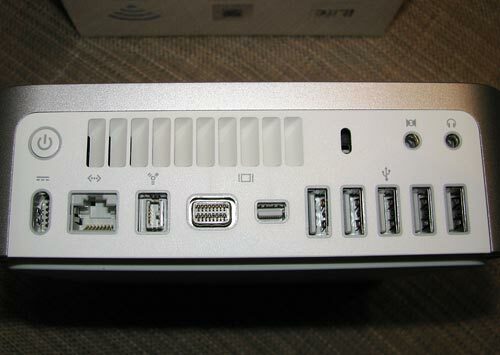 Here is the port configuration in the back: including FireWire 800 and mini DisplayPort. While I didn’t like Apple’s decision to use mini DisplayPort on their MacBook & MacBook Pro, I am happy it is added on the mini besides the DVI port, so it is dual monitor capable. 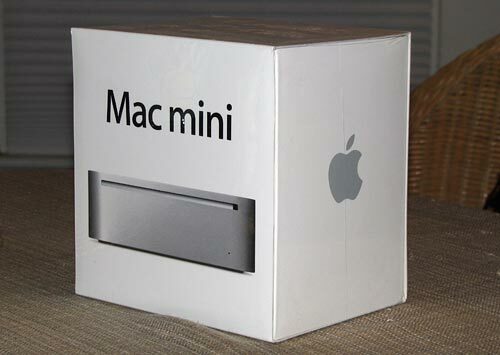 I know some people are interested in the Mac mini 2.26 GHz benchmarks and I will post those next. Default as well as upgraded with more RAM and later with a 7200 rpm drive. 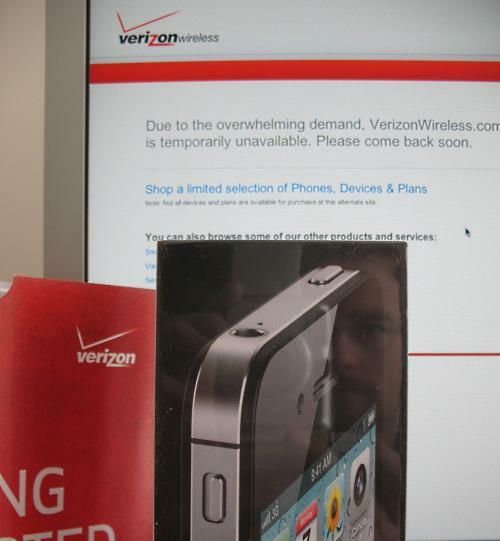 This my entry for the Thoughtfix N810 Giveaway contest. Updated 4/1/2008: Since we now have our own server I can embed the video.